Mountain Ridge harnesses are made with the comfort of our dogs as the first priority! You can choose from several different styles depending on your focus. All are made with 1 inch nylon webbing for durability and padded with either neoprene or triple thick 300 weight fleece that is covered with nylon oxford fabric on our Racing or Distance styles. The Standard is padded with triple thick fleece. The Distance style has two options for weight of the webbing, the original Distance Heavy is 3,800 lb break strength and we also have the Distance Light that is 1900 lb break strength. The option for color is Red or Blue webbing with Black padding in the Distance Heavy and Standard style and Black webbing with Blue padding or Red webbing with Black padding in the Distance Light and Raceweight styles. All in stock harnesses have 24 inches of 1 inch 3M Reflective tape located at the neck, sides and tail. Harnesses can be made without the reflective tape and in different color options. Currently we have Hunter Orange, Hot Pink and Purple webbing as well as a variety of padding colors. Custom sizes can be made though we do try to fit your dog into one of our standard sizes to start as they are exchangeable. Call to place your custom order lead times may vary depending on the time of year. See the standard size chart and harness measuring instructions below the products! What size harness would my dog be? Though we can build a custom size to fit your dog we try to match one of our standard sizes first as it is exchangeable. 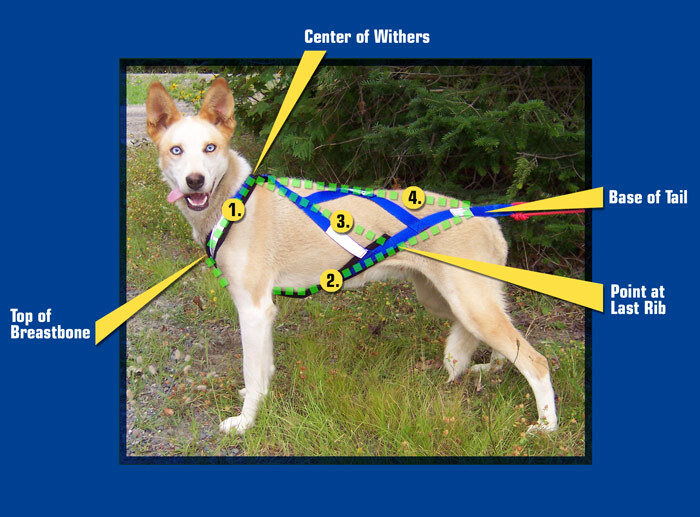 Getting an idea of what your dog measures will help, see the harness measuring instructions below. We strongly recommend contacting us with your measurements before ordering if you are unsure of what size to choose. 1. measure from the front center of the withers to the top of the breast bone. 2. measure from the top of the breast bone, down the chest, in-between the front legs, run the tape down the chest coming up at the end of the rib cage over the hip to the base of the tail. 3. measure from the front center of the withers to the end of the rib cage, at the bottom of the rib cage 4. measure from the front center of the withers to the base of the tail along the spine. Below you will find our standard sizing chart. Sizes above XL are $2.00 extra.